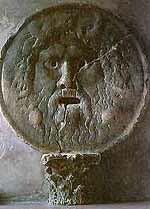 Rome attraction-guides.com - Rome, Italy attractions guide Rome Mouth of Truth (Bocca della Verita) information about attractions, open hours, admission charges, famous marble mask, history of ancient drain cover, legend, atrium of St. Mary's in Cosmedin church, location and address, general tourist information about Mouth of Truth (Bocca della Verita) in Rome (Roma) area, Italy (Italia) IT - Last updated 30/10/2012. Located in the atrium of St. Mary's in Cosmedin church, this world-famous marble mask is known as the Mouth of Truth or Bocca della Verità and is surprisingly actually an ancient drain cover, which was found half-buried during the Middle Ages. According to popular legend, if anyone puts their hand inside the mouth and then does not tell the truth, the mouth will then slam shut tightly and stop them from withdrawing it.